Get out the frozen mixed veggies and the bow-tie pasta, and well show you how to make Creamy Turkey Noodles. 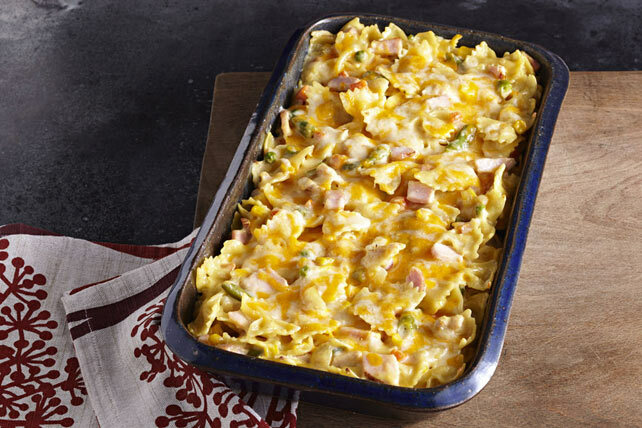 Our Creamy Turkey Noodles is an easy way to feed a crowd. Meanwhile, melt butter in Dutch oven or large deep skillet on medium heat. Add onions; cook and stir 4 min. or until crisp-tender. Add frozen vegetables; cook 4 min. or until thawed, stirring frequently. Stir in flour until blended; cook and stir 1 min. Gradually stir in milk; bring to boil. Cook and stir 2 min. or until thickened. Remove from heat. Stir in turkey, soup and sour cream. Drain pasta. Add to sauce; stir until evenly coated. Spoon into 2 (13x9-inch) pans sprayed with cooking spray; top with cheese. Cover. Bake 30 min. or until heated through, uncovering for the last 10 min. These casseroles can be mixed together ahead of time. Wrap tightly and freeze up to 3 months. When ready to serve, thaw overnight in refrigerator, then bake as directed. Or, bake frozen casserole(s), covered, 1 hour 20 min. or until heated through, uncovering for the last 10 min. This is a great way to use leftover cooked turkey or chicken. Just substitute 4 cups chopped leftover cooked turkey or chicken for the chopped OSCAR MAYER Turkey.